Ask a Manteo resident for suggestions of places to check out in downtown, and almost everyone will include Poor Richard's Sandwich Shop on their list. 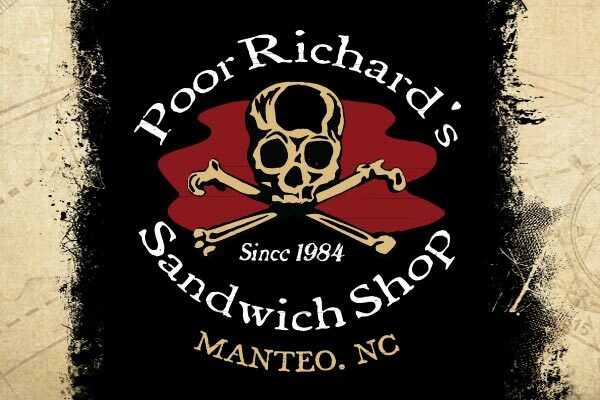 Poor Richard's has been a Manteo icon since 1984, proudly serving deli sandwiches to the town and broader Outer Banks area. Their dishes use Boar's Head products to deliver bread-bound meat and cheese creations that delight foodies of all palates. Their menu ranges from classics, like Italian subs and Rueben, to their specialty sandwiches, like the Heart Attack Wrap and the Angry Burger complete with pimento cheese, applewood bacon and jalapeno. The pub-style restaurant mimics the interior of a ship's cabin: To enter, you climb the sloping ramp and make your way down the narrow, wood-paneled hall to the counter where you'll place your order. Slide into one of the cozy booths or better yet, sit at one of the tables on the open air back porch. Views of the docked ships and Manteo Waterfront make the experience all the more nautical, as you can almost pretend the ground is rocking rhythmically along with the waves. Poor Richard's is a regular nighttime hangout in Manteo. Evening visitors congregate in the pub instead of the deli. There, they sip and swap stories over domestic and imported beers as they overlook downtown Manteo's bustle. Local and regional solo artists and bands make frequent appearances at Poor Richard's, boosting the scene with nighttime entertainment. Whether you're a longtime local or fresh-faced visitor, Poor Richard's Sandwich Shop is a place you should know not to miss.